I’m following a new twitter friend in my twitter feed: MashupAwards. The bio reads “The best mashups on the web” and I’m enjoying the exposure to some combinations I probably wouldn’t have come across without it. I’m particularly fond of Twistori, which was first tweeted by Gary Chinn, and TwittEarth, a twitter public timeline visualizer that uses fun icons to show geographic location of tweets. Even 2itch, a Google Maps mashup that makes it easy to find restaurants, stores, gas stations, and more which are open 24 hours. I love the fact that this unassuming little application has exploded in a way that it has become second nature to many of us. More than this, I love how twitter itself has spawned more third party apps and mashups, because it shows the power of the community by taking what we currently do and applying it in ways originally unintended (or at least unconsidered). 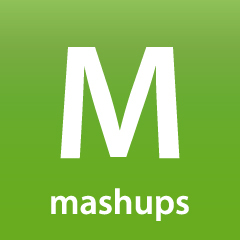 Mashups push my mind in new directions and, while I might not be the creator, I can appreciate it, use it, and incorporate it into my daily life.